The rich history of lacrosse in Europe dates back to 1867 when a team of Native Americans from the Iroquois tribe were brought over to demonstrate the sport to the people of England. Shortly after the Iroquois introduced the sport to Europe it began to spread. Lacrosse moved from England, to the rest of the UK, and then to other parts of the continent. Surprisingly, one of the first European nations to take to lacrosse were the people of what was then Czechoslovakia. At the time it was introduced, Czechoslovakia was still a Communist country. Germany was the next country to follow the lacrosse trend. By 1995 the European Lacrosse Federation (ELF) was inaugurated. The countries that founded the original ELF were the Czech Republic, Scotland, England, Sweden, Germany and Wales. Today, there are 29 countries in Europe that have established or are in the process of developing a national lacrosse program. Many of these nations are also members of the Federation of International Lacrosse (FIL) which was established in 2008 through the merger of the previously separate men’s and women’s international lacrosse associations.Currently there are 62 countries with national lacrosse programs worldwide and that number is growing year by year. n 1995, the year of ELF’s inception, the federation held their very first Men’s European Lacrosse Championship in Prague, Czech Republic. That first year England took home the gold and the Czech home team took home the silver. 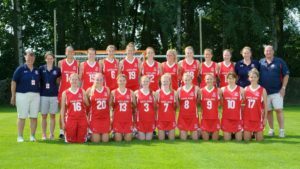 The second year of ELF’s existence marked the first ever Women’s European Lacrosse Championship in Düsseldorf, Germany. Again England and Czech Republic finished in first and second respectively. Up through 2001, the Championships were held annually. Since 2004 the men’s tournament has been held every four years, most recently in 2016. On the other side, the women have played in 2003, 2004, 2008, 2012, 2015, and the next event will occur this summer, July 2019 in Israel. To encourage the growth of lacrosse in younger age groups, the ELF recently establish the Championships for the under 20 (U20) age groups, to give junior players a chance to experience a competition of this magnitude prior to moving on to the senior level. The first U20 Women’s European Championship was held in Katowice, Poland in August 2018. The participating countries were the Czech Republic, England, Germany, Israel, Poland, and Wales. Strangely enough, history repeated itself with team England finishing in first and the Czechs placing second once again. This year will mark the first ever European Lacrosse Championship for U20 Men’s. The Championship will take place in Prague, Czech Republic starting at the end of June and concluding at the beginning of July. The competing nations for this Men’s U20 are set to be the Czech Republic, England, Germany, Ireland, Israel, Latvia, Poland and Wales. In the world today, the growth of lacrosse globally is undeniable. This past summer the FIL held the largest World Men’s Lacrosse Championship in history. The tournament had an astounding 46 countries that competed in Netanya, Israel in July. As was common in the past, team USA took home the gold against team Canada in an exhilarating game that came down to the very final moments of play. With the popularity of lacrosse gaining continuous momentum, it is no surprise that over the past decade or so people have been buzzing about the opportunity for lacrosse to be featured in the Olympic Games. On November 30th, 2018, history was made when the International Olympic Committee (IOC) Executive Board voted to provisionally recognize the Federation of International Lacrosse (FIL). This was huge news for the lacrosse world, as it signifies that lacrosse will be included in the 2028 Olympic Games. Lacrosse lovers rejoice! While lacrosse continues to spread across the globe, the European Championships provide an opportunity for the nations of Europe to gain recognition and to encourage growth within the European lacrosse playing field.